Bespoke Tailoring for your Mens and Ladies Drape Jacket at London Boots. Call Cheryl To Discuss Your Requirements. 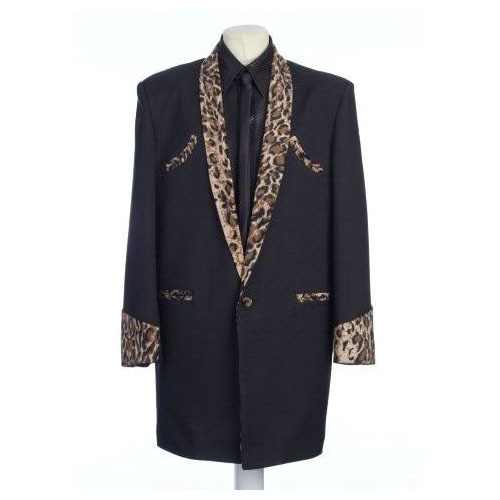 You are viewing a black Skye Clothing drape jacket, trimmed with leopard fur effect on the collar and cuffs, fully lined one button fastening. Thinking of joining a dance class? It's easier than you think! Kali Fraser teaches modern, jive, ballroom and salsa in Grantham, Nottingham and Newark areas. Kali’s dance club Ceroc Heaven has been introducing people to the world of partner dancing for over 30 years! Come along to our evenings for some fun, keep fit, learn to dance and meet great people. Click here for more information. JESSIE J WEARS SKYE CLOTHING! MUST BE THE FACT SHE WORE A SKYE BOWLING SHIRT ON THE VOICE THAT CLINCHED THE DEAL!!!! Shoes arrived at lunchtime, fit like a glove. Sorry for not sending this earlier, it's been a bit hectic still. Trousers were brilliant, and thank you for getting them to us quickly, safe and sound! Just wanted to say thanks SO much for organising the jacket and being so quick on the turnaround. London Boots a great place with friendly service I have had a few Drapes Drainpipes and shoes and been pleased with the results. Called into the shop today hoping to find some new creepers after my old ones that I've had 18 years finally gave up the ghost when the soles disintegrated. Certainly wasn't disappointed, the lovely lady in the shop (cheryl) brought a beautiful pair of tuk leather creepers in oxblood to my attention. So of course I had to have them along with another pair in white which I've ordered. Some wonderful items in the shop and I even got a cup of tea and met a lovely dog ( What more could anyone ask for? ) nice to walk into a shop which feels like home and where you feel very welcome. You've found a customer for life. Visited today for the first time expecting some posh shop, how wrong could I be. Party in full swing and great welcome from Cheryl and Co. Wandered around tried on dresses, went to buy cowboy boots ⛾ ???? ??? ?came out with hand made dress and sundries plus my boots and a happy heart. Great atmosphere nothing to much trouble, should be called hand made new vintage ????. Make sure you visit it's in the castle gym and well worth it to get your bespoke items. Will add a photo of my new purchase — feeling beautiful. I received them today, they are beautiful, excellent work. I will be placing another order after I return from Viva Las Vegas, in a few weeks. My new jacket is stunning...I will be buying one or two more. Lovely quality." "The Jacket arrived to day, it’s brilliant, many thanks. Now already for the party." "Thanks for the excellent service the jacket is great ..."
"..We had a great wedding and the suits were fabulous adding in no small part to the spectacle of the day..."
"The drape arrived today, that was really fast. It fits perfect and looks great..."